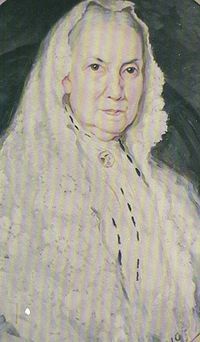 Bathsheba W. Smith was the fourth president of the Relief Society, the official women’s auxiliary of The Church of Jesus Christ of Latter-day Saints, whose members are sometimes nicknamed Mormons. She was born May 3,1822 to Mark and Susannah Ogden Bigler in West Virginia. Her early life was pleasant and uncomplicated, as her family owned a 300 acre plantation. Her early years were spent riding horses and doing handicrafts. When she was fifteen, Mormon missionaries came to her home and were invited in to share a message. As Bathsheba listened to them preach, she gained a testimony that what they taught was true. She then prayed about it privately, as Mormons are taught to do, and again, the Spirit confirmed to her it was true. Her entire family converted. Life became immediately more complicated as others persecuted them for their new faith. This caused them to move to Missouri, where the Mormons were then living. When the Mormons left Missouri, she gave her seat on the wagon to someone who was ill and walked most of the way to Illinois. After arriving, she and her father developed malaria. Her father died from it. In 1841 she married George A. Smith, who had been one of the missionaries that taught her family about Mormonism. He was Joseph Smith’s cousin. Joseph Smith was the first prophet of the Church of Jesus Christ. George was also an apostle, who filled the same role the Biblical apostles filled—special witnesses of Jesus Christ who also led the Church in the absence of Jesus Christ’s mortal presence. He was the youngest of the twelve apostles when they married. Bathsheba was devoted to making a good home for her family. She loved being self-reliant and made most of what she used herself. Her husband was often away on Mormon missions and this allowed her to live inexpensively and to keep busy while she was alone. Bathsheba’s church membership was often very hard, and a distinct contrast to her early days of ease. She witnessed the death of David W. Patton, a Mormon apostle, after he was injured by mobs and brought to her home. He died a few days later. She, with the other church members, were repeated victims of mob violence in Missouri. In Illinois, forced to abandon her home along with other Mormons due to the mobs and the murder of Joseph Smith, she cheerfully turned her beautiful parlor into a paint shop for wagons being prepared for the exodus. When it was time to leave, she quietly swept the floor, tidied the rooms, and put the broom back where it belonged before leaving the home forever. As the Mormons worked their way west, her mother died and her last child died after just four hours of life. When she became the General Relief Society president (meaning that she oversaw all Relief Society organizations world-wide), she introduced the Mother Education classes to help women learn to be better wives and mothers. As Relief Society president, she was in charge of the Relief Society wheat project, in which the women of the church produced and stored wheat for emergencies. During her tenure, she saw that the wheat was donated to victims of the San Francisco earthquake of 1906 and to famine victims in China, regardless of faith. In addition, she arranged for wheat to be donated to Native Americans in need in Utah. She noted that the president of the Church wanted the women to be self-sufficient, with the skills to care for themselves and their families as needed, so she worked to encourage home industry among the women of the Church of Jesus Christ. She served as a temple matron while carrying out the challenging work of the Relief Society. Read more about Mormon history at HistoryofMormonism.com. This page was last edited on 19 December 2013, at 11:05.